There is growing scientific evidence that an imbalance of intestinal bacteria called SIBO (Small Intestinal Bacterial Overgrowth) along with excessive inflammation within the brain are responsible for the features associated with Autism as well as ADD/ADHD, mood disorders, and developmental delay in children. Bacterial overgrowth occurs when large numbers of bacterial that predominantly live in the colon migrate upwards, and increase the number of bacteria within the small intestine by 10,000 to 100,000-fold. This added bacterial load in the small intestine has two consequences that contribute to Autism. First, the bacteria often tend to be of a clostridium species which can produce propionic acid in massive amounts. Propionic acid is a short chain fatty acid that is normally produced in small amounts within the intestine but the higher concentrations are being linked to some of the behavioral aspects of autism. In animal studies, high propionic acid leads to the development of antisocial behaviors, increased sensitivity to sound, light, and touch, as well as gait abnormalities. In human studies, children with autism have very high concentrations of propionic acid within their tissues. Secondly, the increased concentration of bacteria within the small intestine causes leakage of pieces of bacteria into the large concentration of immune cells that surround the small intestine and triggers the inflammatory reaction referred to as leaky gut. Leaky gut causes an increase in peripheral pro-inflammatory cytokine levels and allows for the inflammatory priming of a specialized form of white blood cell known as microglia within the central nervous system. The combined production of inflammatory cytokines and activated microglia are primarily responsible for the developmental issues, seizures, sensory issues, mood and attention disorders commonly associated with autism. A child is born with approximately 100 billion neurons and over the ensuing 18 years, needs to prune these neurons down to 50 billion in a process referred to a synaptic pruning. Excess inflammation from leaky gut, microglia priming and omega 3:6 imbalances prevents otherwise healthy microglia from pruning fast enough, and results in developmental delay. The priming effect from the bacterial overgrowth causes many microglia to shift into the M1-phenotype, and results in the brain being less able to fully repair itself from commonplace physical (falls and bumps to the head), emotional (fear, abuse, neglect) and inflammatory (surgery, infections, vaccines) brain injuries. A small residual amount of damage will remain after each injury, and each new injury leaves residual damage upon the prior injury in a process referred to as cumulative brain injury. The abnormal neurological functioning from cumulative brain injury can occur slowly over time and or rapidly depending on the intensity of the brain injury. Damage to different portions of the brain will result in different outward symptoms such as ADHD, chronic anxiety or gait abnormalities. The elevated inflammatory cytokines are also able to turn on certain genes that are linked with autism and may be responsible for certain features or more severe forms of Autism. And finally, the excessive inflammatory environment in the brain reduces the seizure threshold and make seizures more likely to occur. The drop in the seizure threshold from inflammation is seen when young children without Autism develop febrile seizures with the fever and inflammatory reaction that occurs with simple upper respiratory viral infections or middle ear infections. My understanding of the bacterial and inflammatory features in Autism have opened the door for me to provide groundbreaking treatment. The bacterial overgrowth increases propionic acid levels that cause kid’s brains to function differently, almost like a chemical impairment or slight intoxication, and at the same time the inflammation prevents normal neuron pruning and development as well as inhibits normal brain injury repair. 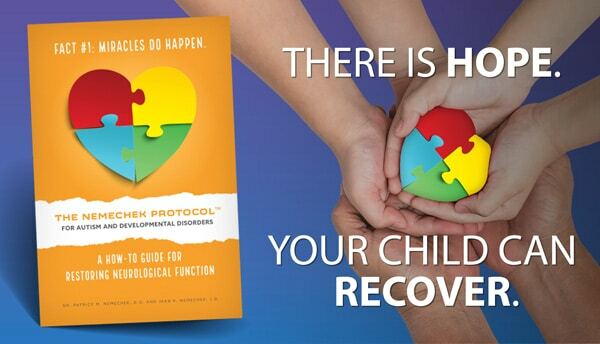 My approach to reverse the key components in Autism is straightforward. To provide the brain with a healthy, non-inflammatory environment to function more normally and to allow microglia to correctly prune and repair the brain, we need to reverse bacterial overgrowth and suppress the production of inflammation cytokines that are produced from a variety of sources. 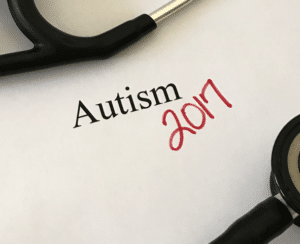 By applying a logical understanding of science, I have focused application of The Nemechek Protocol™ medical consultation and treatment services on Autism, and have reversed the key features of Autism in many children. The Nemechek Protocol for Autism uses a prebiotic fiber called inulin to reverse and control bacterial overgrowth, and high doses of omega-3 fatty acids to normalize microglial function and normalize the inflammatory state within the brain. Cooking with domestic extra virgin olive oil also helps reduce brain inflammation resulting from linoleic acid, an omega-6 fatty acid found in in high concentration in cooking oils and processed foods. Inulin is a natural fiber found in onions, garlic, artichokes, agave, chicory root and many other plants. I find that 2-4 inulin gummies or 1/2 to 1 teaspoon of powdered inulin daily can reverse bacterial overgrowth enough to allow an autistic child (2-8 years of age) to become much more aware and interactive with their environment within a few weeks. And depending on the amount of underlying developmental delay, children will often start speaking within a few weeks to a few months. Remember this is a simple plant fiber found in foods we eat every day, and is safe in children. If children get a little gassy or bloated, I recommend cutting back on the dose. Inulin is heat-tolerant and can be mixed or sprinkled over any form of liquid or food. To help reduce the inflammation within the brain and normalize the behavior of microglia, my autistic patients are placed on omega-3 fatty acids (EPA and DHA) from fish. A recommended starting dose for small childrens is about 600 mg of omega-3 (the total of EPA plus DHA) per day. DHA is particularly important as it is the main omega-3 in the brain. (Read this post for more information on DHA as brain food.) Omega-3 fatty acids may be given in the forms of simple fish oil mixed in their food or drinks. I don’t recommend fermented fish oil. And when dosing I tend to increase the dose of omega-3 is the children are older (specific dose for varying ages of children can be found in The Nemechek Protocol for Autism and Developmental Disorders) When in doubt, I favor a high dose. If children have difficulty with diarrhea or prior problems with fish oil causing diarrhea, I have the kids start inulin fiber alone for 2-3 weeks in order to let the gut bacteria balance out, and then slowly increase the dose of fish oil and usually the tolerance is much better. Whether the parents use Nordic Fishies or or another brand of liquid fish oil, I recommend they buy a high-quality brand as there is a very high level of fraud in the supplement industry. The bigger, older children with autism require more effort and higher doses of inulin. To gain better control of SIBO in older children I often treat with a 10-day course of Rifaximin (Xifaxan in U.S.). Rifaximin is a non-absorbable antibiotic that is only used for other bacterial overgrowth conditions (hepatic encephalopathy and IBS with diarrhea). Follow-up use of inulin after Rifaximin is sometimes used if intestinal symptoms are still present. If inulin does not make any significant difference as a follow-up therapy, I stop it. I never add probiotics after resetting with Rifaximin because probiotics can easily make things worse even if they helped prior to the use of Rifaximin. The brains of older kids that have experienced prolonged bacterial overgrowth and inflammation as well as more brain injuries that occur over time, generally take longer to show improvement but I have seen significant progress in older kids as well. I care for 2 teenage non-verbal autistic boys (14 and 16 years of age), and although they showed signs of continual improvement, they took about 4-5 months to begin speaking. More recent is a remarkable case of a 23-year-old non-verbal autistic girl with frequent seizures. Within 8 months her seizures had reduced from 5-7 per day to 2-3 per week, and she can now write her name and converse in both Spanish and English (she lives in a dual language family). For autistic children, the Nemechek Protocol will need to be daily and possibly forever but the benefits are life changing. Inulin fiber, omega-3 fatty acids and olive oil are from natural sources, are commonly consumed by most of us every day, and are available without prescription. I am a classically trained internal medicine physician (D.O.) from UCLA and my Internal Medicine and Autonomic practice is in the Phoenix area. My research background has been focused on the Autonomic Nervous System, brain metabolism, and metabolic inflammation. I use all available scientific and medical tools to induce the nervous system and organs to repair themselves by normalizing inflammation control mechanisms, inducing natural stem cell production, and re-activating innate restorative mechanisms. Uniformly all the kids under my care (50-60 to date) seem to be improving in significant ways. In terms of speech, some younger kids start speaking within a few weeks while kids in the teens might take 4-6 months. Our 23-year-old patient didn’t start speaking until after 8-9 months of treatment. Importantly, even the most severe cases have a noticeable improvement in their awareness of their surroundings within a week or 2. I interpret this as a decline in the toxic effect of the propionic acids on their brains. Parents report more eye contact, awareness or acknowledgement others have entered the room. They also seem more tolerant of being touched or held, or are more willing to approach someone and be physically close to them. After the first few weeks, recovery rates are highly variable, and I believe this is due to the degree of developmental delay underlying the toxic state. If the inflammatory cytokine process has been going on since birth, there can be so much developmental delay as to be labeled mentally retarded. But if the developmental delay is simply mild, kids may seem very functional quickly. The important point to remember is that your child’s brain and an enormous capacity to continue the path of development once the inflammation is controlled. Neuronal/synaptic pruning will re-initiate, and according to the developmental delay literature, they can catch-up about 2-3 months of development for every 1 calendar month. In my estimation, it seems to advance this fast if not faster. The underlying wild card is what gene has been activated by the inflammation and what might it do to the neurological impairment of your child’s brain. The inflammatory environment that prevents normal synaptic pruning and recovery from brain injury also triggers the litany of genes being found in autism. Inflammatory cytokines abnormally produced by the mother are affecting the child’s nervous system within the womb, and then the imbalance of intestinal bacteria of the child as well as high omega-6 food sources continue to fuel the inflammatory process within the child after birth. These inflammatory cytokines are the primary process through which the genes within the DNA that had been dormant for 1,000’s of years in the child’s ancestors are finally activated, begin altering how cells function, and contribute to the overall variety of neurological, behavioral characteristics that manifest in autism. Here’s the potential for recovery in the autistic brain. A 23-year old non-verbal autistic female (Lennox-Gastaut Syndrome), was having 6-8 seizures per day and had never held her parents gaze for her entire life. She did not like to be held, could not color or write, and sat curled up in a chair most of the day rocking. Within 2 months’ of starting our protocol (rifaximin, high dose omega-3 fatty acids, and mother cooking with California olive oil), her seizures had dropped to 1-2 a day, she would sit upright in a chair and she slept through the night. At month 4 she started looking her parents in the eyes and holding their gaze, and was more able to be touched and hugged. At her month 6 office visit, she started smile at me, her seizures had reduced to 1-2 per week, she could now write her name (although she had never been shown previously) and could draw objects that were recognizable. At 8 months, she began speaking rudimentary Spanish and English (dual language household) but emotionally is behaving as if she is 3 years old. At 18 months, she speaks very clearly in full sentences, her seizures have declined to 1-2 per month (despite discontinuation of 2 seizure medications), and her emotional maturity has risen to about that of a 4-5-year-old. But don’t despair. No matter how badly the developmental delay has slowed brain maturation, the potential for an unbelievable recovery is present. We are beginning to understand that once human genes are turned on by inflammation, they can ultimately be shut back off again once the inflammatory environment within the body is significantly reduced. Do your best to be patient and give this approach a chance. Because the path to recovery over all things medical is 3 steps forward, and 1-2 back, compare today’s behavior to last month’s, not yesterday’s. The neurons within the human brain, like your hair, can only grow and change only so fast. Every month, your child’s brain has the ability to “catch-up” 2-3 months in development. That means every calendar year, they may catch-up 2-3 years. I believe once the inflammation is suppressed, all that is required for recovery is a good solid inflammation suppressing regimen and patience. The conclusion that increased stemming, less sleeping or increased anxiety is from inulin feeding “bad” bacteria such as Klebsiella has been a concern of several commenters. I’m not saying this is impossible but I do not believe that to be the case, and have never seen such a reaction in the many children I’ve worked with. There are several reasons for this. First, inulin’s main effect is within the lumen of the small intestine where bacteria digest inulin through a process referred to as fermentation. The primary effect is the production of the healthy short chain fatty acid known as butyric acid. Only small amounts pass through to the colon. Secondly, a significant increase in pathogenic bacteria, or overgrowth bacteria would almost certainly cause an increase in diarrhea, stool frequency, abdominal cramping, reflux and eczema. We do not see this, and in fact there in general a reversal of these symptoms with the use of symptoms with the use of inulin. If the intestinal ( not neurological or behavioral) symptoms were to worsen on inulin, I would suggest the inulin be discontinued and would suggest using Rifaximin. The development of constipation with the use of inulin is a sign of underlying autonomic dysfunction from developmental and cumulative injury that eventually reverse after a few months of fish oil. Thirdly, propionic acid has a sedating effect on children, almost as if the children had been taking Valium or Xanax. Therefore, once inulin reverses the bacterial overgrowth and the propionic acid levels decline, the children will come out of their stupor. There behavior at this point is predicated but their pre-existing developmental abnormalities and cumulative brain injuries and not some toxic effect of inulin. A fourth point is that the detection of pathogenic bacteria such as Klebsiella in the stool by no means suggests these bacteria are present within the small intestine where inulin has it’s main effect. Detection of pathogenic bacteria such as <em>Klebsiella pneuomiae</em> or <em>Clostridium difficle</em> are commonly in asymptomatic patients and are essentially harmless. Their growth is kept in check by a healthy balance of other bacteria which is further bolstered with inulin. And finally, some parents are worried about overgrowth of candida. I agree that candida and other yeasts/fungi inhabit the intestinal tract but more detailed studies demonstrate yeast/fungal overgrowth does not occur in autism. And while the observations of clinical improvement about reduction of sugars and etc. are correct (think GF/CF, FODMAPS, GAPS), they were misattributed to yeast instead of the bacterial overgrowth for which we have mounting evidence. Because of this, I believe the use of potent anti-fungal drugs is unwarranted in the specific treatment of autism. © 2017. Dr. Patrick M. Nemechek and Jean R. Nemechek. All Rights Reserved. Patent Pending. Does ionic foot bath interfere with the protocol? Is it ok to use Zyrtec for a 3.9 years old while on protocol? I’m sorry but I cannot give specific recommendations for your child on the blog. As a general rule, if you are using doses in the upper ranges I use in my protocol and sticking with the approved brands, my experience is the answer would lay more in the VNS rather than rifaximin. Is it okay to give Melatonin and the vitamin deficiency supplements prescribed by the doctors? I recommend following your physician’s specific advise about supplements. Some kids really need iron or B12 for instance for these deficiencies. Good evening, Mr Nemechek! My son is on protocol since 6th of December, 1tsp of inulin, 7.5 ml of evoo, 2.5ml of fish oil. I give him antispasmatic because of epileptic symptoms. Now there are some red spots on his back. They don,t look like alergic, they are gainy. Should I go on protocol? Is this appearance of spots because of protocol? I would think this is from the protocol. Either way (relapse or awakening) it represents underlying developmental issues. If it is too intense try decreasing the inulin dose a little. Hello Dr N, I started protocol one week ago, my son is going through awakening. He is extremely hyper, jumping, stimming, doing lots of finger movements nearby eyes, screaming, running here there, lots of mouthning, teeth grinding got more worse. We have noticed little awareness but negativity is far more than awareness. He is 4 year and getting 1/8 Inulin, 1 ultimate omega capsule, 12-15 ml EVOO. Should I need reduce Inulin to 1/16 to manage the negativity? We are very scared to see his behavior. Pls advise. Dearest Doctor Patrick Nemechek.i need your help .i want to know if ultimate omega 2840 is given to kid 6.10 year old since 3 months near .Can the children dha 530 given for few days because of non availability of ultimate omega?actually ultimate bottle is broken accidentally and now I have children dha 530 strawberry flavour .need to know both r same if dha plus epa same quantity given or affects the process of recovery ?need only your suggestion . Do not worry about the DHA content for children, dose according to the total omega-3 amount. I would avoid using strawberry flavoring in the future be I have some concerns it may of prevented recovery in a few cases. Thanks great I am so much worried.thanks a lot . I had given children dha strawberry flavour at starting of protocol two full months and saw awakening and few gains also .i try my best to give ultimate omega as soon as possible .pray and hope recovery not stop due to strawberry flavour till . I would split up the treatment and maybe just slowly increase the inulin over a few weeks. After he seems to be tolerating this, then add in the fish oil. The incidence of bacterial resistance to rifaximin is much, much lower than other antibiotics. There is a 30-year history of patients with hepatic encephalopathy being on rifaximin continuously throughout the year but with a very rare occurrence of resistance. The practical reality is the kids I treat do not relapse very frequently and at this point have not run across any cases suggestive of resistance. Unfortunately I’ve never had a patient under these circumstances. If she is on inulin, her SIBO won’t relapse during treatment. If she has been treated with Rifaximin, you just may need to occasionally retreat her if any symptoms suggestive of SIBO (see my YouTube video on SIBO Fingerprint) arise. Thank you for your reply! She has been only on inulin but I was just considering Rifaximin. Since you mentioning it I suppose it is safe to give her Rifaximin while on GH therapy which will last for years. Maybe someone out there on protocol and under similar circumstances will see this and share experience. All the best to you and your team! Jean and I are very frustrated with the lack of availability of VNS for all the families around the world. Your doses are good. Maybe you can scratch out a little more improvement by pushing up the inulin a bit. Ok. Thank you. Yes we Are using upper doses recommended brand. 2 tsp and 1/2 tsp NN ultimate omega ( 1500 EPa dha). I tried upping omega but he gets very irritated. I will wait for the vns if that does not do the trick I will try antibiotic. It possibly might help but I would eliminate anything without running it by the neurologist. First choice would be to get rid of the supplements being used “just in case”, and continue those which there are demonstrable low levels. The addition of vagus nerve stimulation can also be of help in recovery. In your son’s case, the implantable units would be the preferred method. Our transcutaneous unit might not be potent enough. Okay, I certainly feel comfortable stopping the “just in case” ones for a few weeks to see how it goes. Thank you! Good evening, dear doctor! We cannot find evoo California anymore. What label do you recommend now? Go to the COOC.com website and you will find a long list of COOC-certified olive oil producers. Most of the ship direct to the consumer. Dr N you owe every parent following your protocol a free course of rifaximin for all the stress and axiety the awakening has caused us (haha). Was just wondering why new stims emerge? We passed the awakening a few months but our 5 year old has just started waving fingers infront of face. Started two weeks ago. We are giving max dose inulin already. Im not too concerned about it, but could it be from a minor head injury he had around about the time it started? I can say why, but we see things come as the kids recover – stims, laughing fits, obsessions. Might be another manifestation of neurological imbalance and different circuits are coming back on line or possibly the manifestation of minor, unrecognized injuries. The good news is they seem to pass as soon as they appear. You don’t diagnosed folate (folic acid) deficiency, one should use a blood test called RBC Folate level. Can Rifiaximin be given to a 6 year old if Inulin is not working? 6 months on protocol Mild ASD Non verbal kid. Reached 1+3/4 tsp NOW Inulin already. 2 softgels Now FO and 30 ml EVOO. All approved brands. No Prebiotics, no supplements. No improvement in awareness. No major gains/changes since starting protocol. Kindly advise. Thanks for all you do. YEs it can. If there was an awakening but no progress after that point, the next treatment needed in vagus stimulation. Don’t worry so much about the foods when starting – stay focused on getting the fish oil, olive oil and inulin right. She is probably craving the sugar in the ice pops (called popsicles in the U.S.) because the boost blood pressure and oxygen delivery to her head. Low brain blood pressure is a common side effect of the autonomic dysfunction occurring from cumulative brain injury. This is also what drives a lot of hyperactivity, hunger, thirst and anxiety. It will calm down and eventually go away as her brain repairs itself. About the start the Protocol next week (as stated previously). I see that the Nordic naturals Ultimate Omega only has 225mg of DHA per 1000mg pill. Does that mean I need to take 13 pills a day to hit 3000mg of DHA as a 48 year old adult? Is there other recommended ways of getting this dosage? Also, should I WAIT until I’ve taken the Rifaximin course for ten days before I start the DHA supplement? And if you are looking for a Guinea pig, I enjoy problem solving and would love to assist in furthering your work. Thanks. For adults wanting to use Nordic Naturals brand, I recommend the NN DHA Extra – it has about 500 mg of DHA per capsule so you’ll only have to take 6 per day. The Now Foods DHA-500 is similar (6 per day to hit the 3,000 mg of DHA mark) and is generally less expensive and works well. Hi, My daughter has chromosome 14 deletion, developmental delay and Seizure. I am going to start protocol, I know it is OK to continue her seizure medicine (Keppra) what a bout B6 and B12 ( she gets these to reduce Keppra side effects)? If those were prescribed by the neurologist then I would continue them. Good morning Dr.! My son 2.9 has been on the protocol since the end of October, a lot of gains since then. A few days ago I increased the inulin from 1/4 tsp to 1/2 tsp, and we are experiencing an awakening, a lot of stemming, climbing furniture,crying for nothing, and less sleep, but also more sounds and trying to say words. Should I hang in there or decrease the inulin to 1/4 tsp. TIA! I am sorry but due to the large volume of requests, I am restricting my responses to those of a general instructive nature and will no longer give specific advise on dosages, etc. Does anyone here have feedback using extra virgin olive oil grown in Australia? In particular Cobram estate oil. I have no experience with the Safe and Sound protocol. I believe the blood testing over the OATS testing (which is generally unreliable as this case shows). Something is interfering with her recovery. Although she is 6, the inulin might not be working and she might be needing rifaximin. That being said, the number 1 cause of this scenario are other supplements, probiotics or homeopathic remedies. Hi my son is 5 years and he is the protocol since 4 months along with occuoational and speech thherapies. The gains have been better attention and responsiveness. But recently we good allergy testing done. His IgE levels against olive is 1.6 IU/ml. My doctor suggested against olives. Can you suggest a replacement for EVOO? There is none. Don’t worry about the IgE testing. The real test for allergies is if a substance bothers someone when ingested or inhaled. It is in appropriate for me to give any advice on such a complicated case without an in depth face-to-face visit. The dosages are proving they are adequate to start recovery. sure doctor I’ll keep that in mind. I would like to know about your view on using Nutritional yeast. I hear its a good source of B vits which our veg foods lack. I strongly advise using probiotics of any kind, bacterial or yeast/fungal. Sounds like you’ve had an awakening – increase eye contact and increased activity. Things will improve, just hang in there. i want to switch natrual nordic to soft gels dha double strength for 4 yrs boy.should i start from one soft gel? Just use an equivalent amount of omega-3. 1) Is there any downside to just taking the rifaximin if you are not sure the inulin fiber is working? 2) is there such a thing as too much fish oil? Are there any medical side effects to an overly high dose and what would too high a dose be as we consider increasing? 1. Rifaximin seems generally safe but inulin provides a much more stable clinical course over time (no relapses). 2. Definitely yes, this is why I constant discuss staying within the guideline in my protocol. Does this mean she doesnt have autonomic nervous system dysfunction? Nothing good or bad for the past 2 months . I understand it’s still early but I mean nothing ? Also do your pts gain weight on your protocol ? Thank you very much . I’ve never needed doses beyond the maximums I discuss in my book. HAng in there, your appointment is right around the corner. In a post, I saw that you recommended the individual stop homeopathic remedies due to increased stimming, as they might be interfering with the protocol. Would you recommend stopping homeopathics while on the protocol regardless or only if there is a negative side effect? Also, I’ve read that too much Omega 3s can have adverse effects. Would you say there is a limit to Omega 3 consumption where the supplement becomes counter productive? I recommend only using COOC-certified oils. IF it doesn’t have that COOC seal, then I’ll tell you not to trust it. 1.5 tsp of inulin is usually more than enough for the majority of kids. Hello. Two questions. #1 – My son has been on the protocol for 1 week. We started with 1/8tsp/day Inulin for the first 3 days and then moved up to 1/4 tsp/day. His poop is a little harder but he’s still pooping once a day. We haven’t noticed anything else yet, positive or negative. How long should we wait before we increase inulin again? Second question. We get pasture eggs, but most pasture eggs are still fed a supplemental diet of grain or wheat. Is a supplemental amount OK as long as it’s not their main diet? 1# – be patient. Improvements come slowly. 2# – The eggs are fine. My 4 year old autistic nonverbal son. He is getting leucovorin as we got FRAT positive through blood test. Will it be ok to take while on Nemcheck protocol? Pls suggest. Hello. My 7 yo daughter has Eosinophilic esophagitis (inflammation in esophagus due to allergies), she also has a stomach ulcer. She’s been on the protocol for a few weeks, just wondering if we should stop it to heal the ulcer or the protocol might actually help with the esophagus inflammation and ulcer. Thank you! The protocol often helps heal the eosinophilic esophagitis. When Nemecheck says awakening you better believe it. After 6 months of tears and an uncontrollable 4 year old, I have now ended up with a perfectly behaved and focused toddler who is just with us again and loving life. He also calls me “mum”, so many happy tears in this household. I cant believe the awakening you describe is this intense and REAL. I’m so glad I didnt give up. Please keep pushing through guys. Thankyou Dr Nemecheck. Thank you for your feedback and the words of encouragement to all the others who read this blog. I know the “metals in the brain” idea is quite controversial and not accepted by most physicians. But I wanted to ask, IF there is mercury or aluminum in the brain, is there any reason to believe that the metals could actual have a chemical reaction to higher propionic acid levels in the brain effects? From a pragmatic level it doesn’t matter if there is or isn’t heavy metals involved because children seem to recovery with my protocol without address this directly. Maybe the bacteria can naturally chelate the metals – there is a little evidence suggesting this might be the case. Its hard to say if she needs more inulin but I think 2 tsp would be the max for almost any kid. The only thing I can say is that after this long on the protocol he probably needs vagus nerve stimulation. I hesitate to say that because I understand how hard it is to get this type of help and for many, traveling to the U.S. is a financial impossibility. My grandson is allergic to fish, is there alternative to omega 3’s? The aggressive behaviors are from the developmental imbalance the brain is experiencing. Watch my video on Aggression and Anxiety and try tapering back off the inulin dosage a little. Inulin does not cause bruising. Secondly can we buy olives , make its oil (where it can be before us)and use evoo instead cooc seal evoo ? Is cooc certified oil has other medically benefits ?if yes then what r those benefits? I have not seen different forms of inulin make a difference in the patients I personally manage. Of course, home pressed or locally grown olive oils are fine. The concern is with the international olive oil market. If oils are imported, there is a high percentage that is fraudulent. Subscribe and get helpful tips for The Nemechek Protocol™ delivered weekly to your inbox!